When visiting Costa Maya, Mexico, there are several options for tours and excursions. This cruise port has grown rapidly over the last few years adding new port amenities and experiences that allow you to explore this Western Caribbean gem. 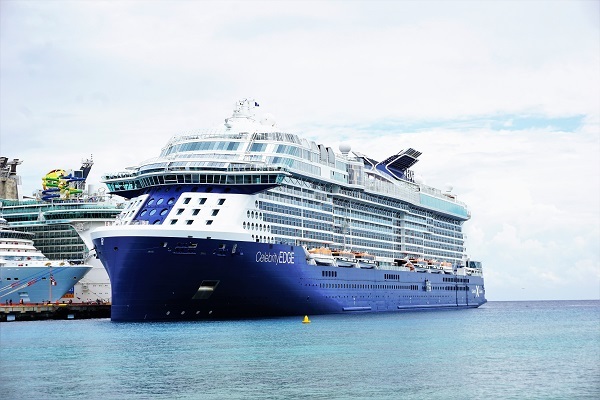 On our most recent trip on Celebrity Edge, we decided to try one of the many popular beach breaks. Booking well in advance, we secured a reservation at the exclusive Maya Chan Beach. If you are wondering whether this beach break is right for you, we have put together our honest Maya Chan Beach review. 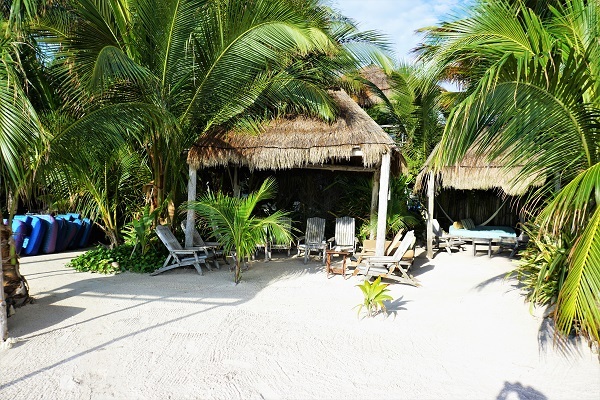 The Maya Chan beach break experience is limited to under 100 beach-goers. If you are considering reserving for your family or a larger party, do know that spots fill up quickly. In fact, we had planned to visit the beach on our November 2018 cruise, but they were already sold out when we contacted them 4 months in advance. Instead, we made a reservation for our January 2019 cruise. The take away message is that you will want to contact the beach resort well in advance to secure a spot. Currently, the cost is $59 per person for adults, and children’s pricing ranges from $19 to $49 depending on age. All reservations can be made online with a $10 per person deposit. After completing the reservation form, you will receive an email indicating whether there is availability for your selected day and party size. If there is availability, a deposit must be made within 24 hours to confirm your reservation. Once reserved, the final payment is required 14 days in advance of arrival. All payments are made through PayPal. A great feature of this beach break is that round-trip transportation is included in the price. Getting to the meeting location requires about a 15-minute walk. You will need to depart the port area and follow the instructions on the map that is provided to you in an email. Finding the attendant was easy. Once confirming your name on the list, you are given a wrist band and instructed to wait for the next available transport. Do be aware that there might be other tour providers pretending to be from the resort, so make sure that the individual is wearing a Maya Chan shirt and next to a sign with a logo. The arranged transportation vans hold about 10 people, so they can stagger how many people arrive at one time. Luckily, we were among the first off the ship and were on the second transport to the beach. For the return trip home, the staff comes around after lunch asking you to choose a time slot for the transport back to the port. They provide plenty of time for you to get back to the port to ensure that you will not miss your ship. 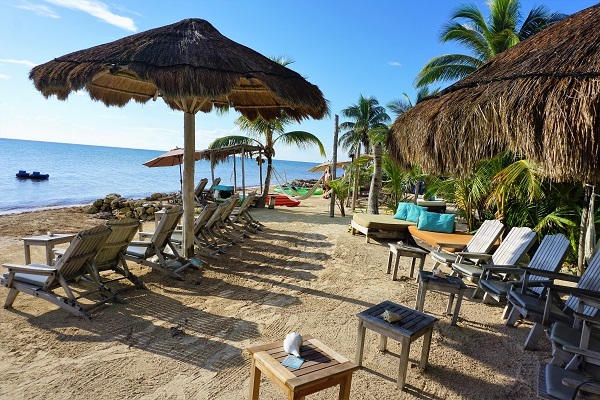 After a few hours of enjoying the beach, you may never want to leave! It takes about 25 minutes to arrive at the location, and yes, it is a bumpy ride! Once you arrive, you are given a brief orientation of the resort facilities and escorted to your reserved location. When you arrive, you will feel like you are in the middle of the jungle. This natural appearance adds to the atmosphere of the entire beach area. You are greeted by David, one of the owners, and introduced to other members of the staff. The main restaurant and bar is a covered pavilion that is located right in front of the property. Along the beach are authentic beach chairs with umbrellas. Set-ups near the beach also include a beach bed. For larger parties, you also receive cabana-like structures, either a palapa or pergola, to offer extra seating and shade. Groups are kept together, and every party is given a specific reserved spot for the day. Your exact location is determined by the resort based on several factors. 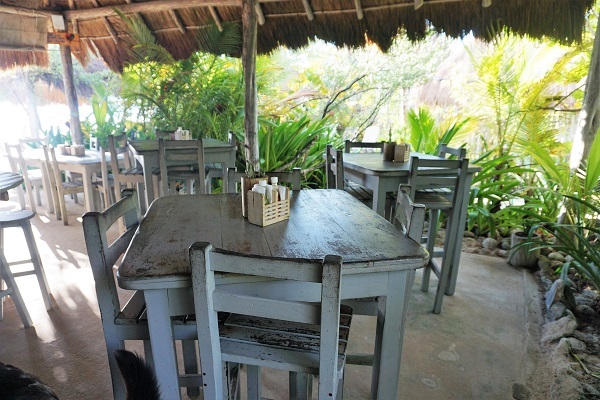 Booking earlier will ensure that you have a spot closer to the main restaurant and the beach. There are also chairs situated near the pool and are not directly on the beach. So, don’t book too late or you may end up here. We did see a few of these couples ask to be relocated, which the staff accommodated. The seating arrangements are strategically positioned across the beach to provide some privacy. On the far side of the beach, there is a smaller bar, a pool in the shade, and restrooms. The beach itself is intimate and not very big. You can walk from one end to another in a few minutes. The beach is groomed every day to remove as much seagrass as possible to improve swimming and snorkeling conditions. 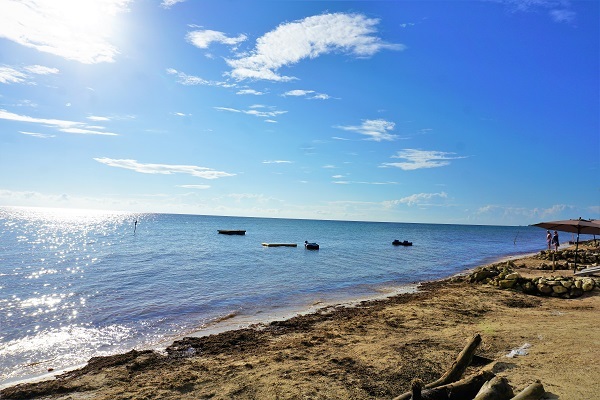 The resort is committed to maintaining the natural beauty and coastline, so no machines are used to dredge the water or to make the beach look more appealing. Given that, the beach is probably not the most crystal clear waters that we have ever seen in the Caribbean, and it was quite shallow meaning you had to get pretty far from shore to snorkel. Maya Chan is truly an all-inclusive beach break which includes complimentary use of all non-motorized water activities. 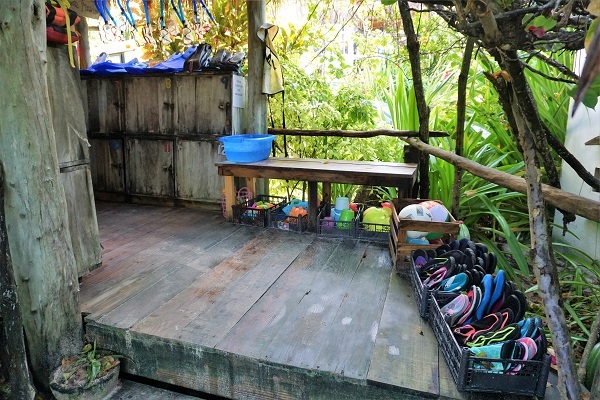 Snorkel gear and water toys are located in the front of the resort for beach-goers to enjoy at their leisure. Of course, you can feel free to bring your own too. 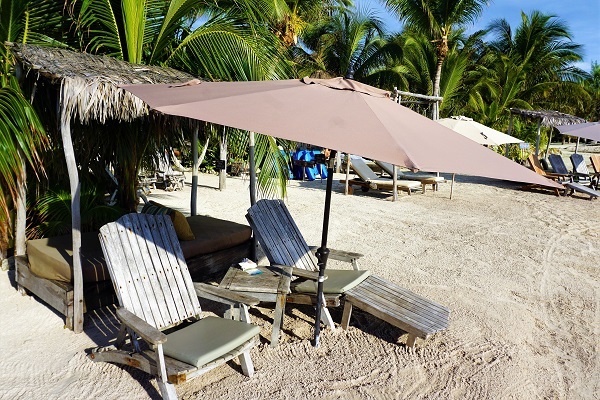 On the beach near the main restaurant and bar, there are also kayaks and stand-up paddle boards which are free to use. You can even grab a floating chair to lounge in the water with a drink in hand. We found there to be an adequate amount of these included amenities for everyone who wanted to use them throughout the day. The Maya Chan beach break does not offer any additional for-fee water activities like guided tours or wave runners. They do offer massages, but you will not be bothered with vendors trying to sell you stuff while on the beach. The all-inclusive package includes all alcoholic and non-alcoholic beverages. The Maya Chan specialty drink menu is small, but the bar is well stocked, so the bartenders can make almost any drink. We tested out the homemade sangria, margaritas, and some frozen drinks throughout the day. 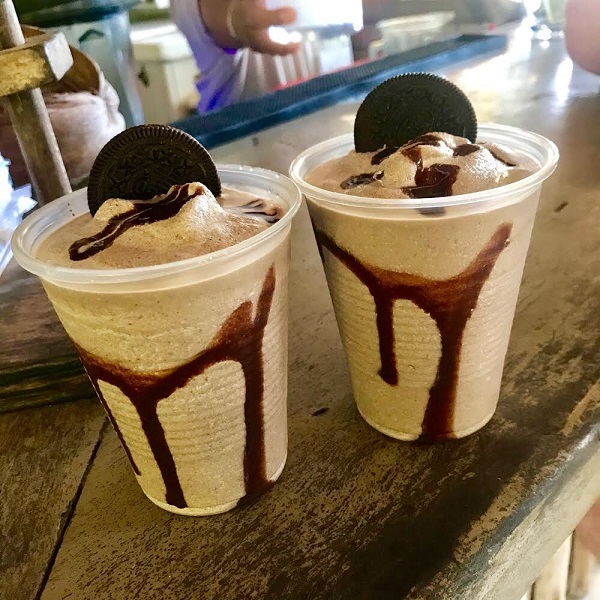 At the end of the day, we were introduced to a frozen drink made with Oreos, a personal creation by Carlos the bartender. It was probably a thousand calories but delicious! 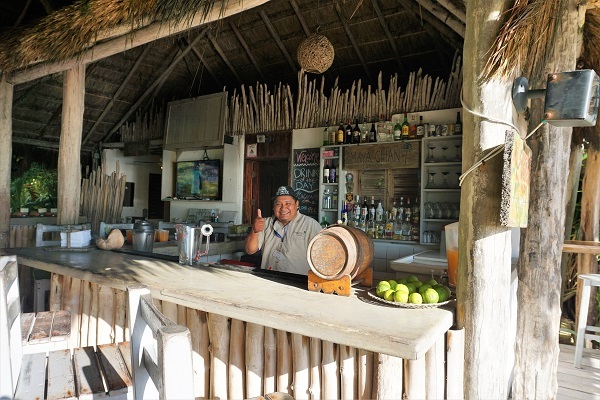 You can feel free to walk up to one of the two bars at the resort to order drinks, but there is really no need to do so. There are plenty of servers walking up and down the beach that are ready to take your order. In fact, the service was some of the best that we have experienced at a private beach resort. 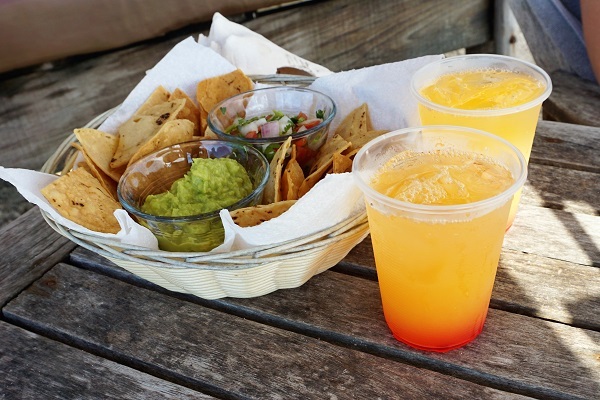 When you arrive, you are greeted with a welcome rum punch and some chips with pico de gallo and guacamole. Around 11:30 am, we were informed that lunch was ready and that it would be open for about two hours at the main restaurant pavilion. Lunch consisted of a taco buffet with chicken, steak, fish, and pork as well as a small custom toppings bar. The food was average in our opinion. It was freshly made and plentiful, but the options were somewhat limited. However, considering we did not do much besides lounge in the sun, the light lunch and snacks were enough food. We spent about 5 hours enjoying the warm, sunny weather during this all-inclusive beach break. 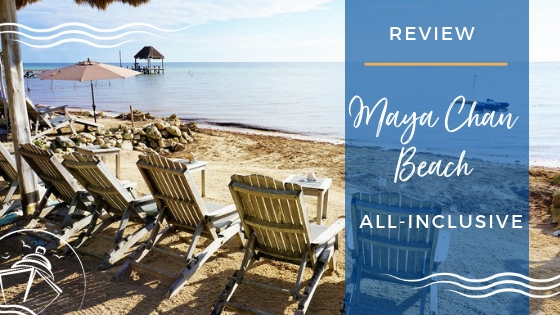 Having everything, including round-trip transportation and use of water activities, covered in the price makes Maya Chan Beach a great value as an all-inclusive beach experience. There were plenty of beverages to go around, and the service staff was very attentive and friendly. You could tell that they enjoyed working at the resort. On the other hand, the food was pretty average and limited in selection. We personally prefer an a la carte menu to a buffet. Given how much we eat on the cruise ship, this is certainly not a deal-breaker for the resort. Compared to other all-inclusive beaches, Maya Chan is very small. The beach is secluded, crowd-controlled, and allows for privacy. While this appeals to many cruisers, the beach itself is not very long or wide. If you are looking for a larger stretch of beach, this probably isn’t for you. 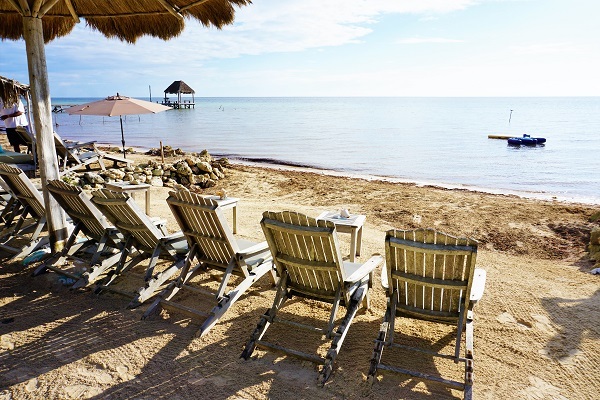 When compared to other beach experiences, Maya Chan is a wonderful option for couples, families, and groups alike. All the additional value, including the water sports, will make the little ones happy, while the open bar will make mom and dad smile! The serenity and privacy will appeal to couples, while the unique seating and accommodation options will appeal to larger parties. We would certainly recommend this beach break for those looking for a more tranquil and natural experience. For us, it was a great way to relax. We were well taken care of and appreciated the hospitality of the staff at Maya Chan Beach. 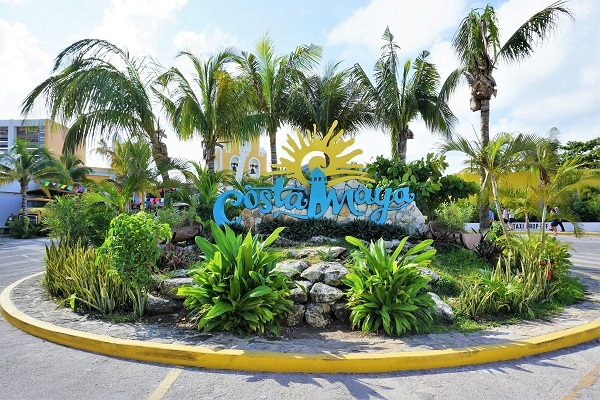 Certainly, we would stop in again on a future trip to Costa Maya, Mexico. Have you been to Maya Chan Beach? What are some of your favorite things to do when visiting Costa Maya, Mexico? Drop us an anchor below to share your review of this all-inclusive resort with fellow cruisers. We were at Maya Chan in January, 2019. We absolutely loved it and will go again! Well worth the price.